Applications of Iridium Crucibles - Furuya Metal Americas Inc.
Iridium crucibles are mainly used for a particular method of crystal growth, called the Czochralski Method or CZ Method. 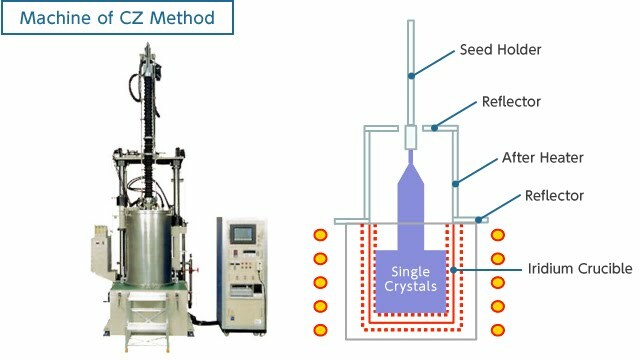 In the CZ Method, seed crystals are introduced to melted raw materials in the crucible. This mixture is then rotated and pulled up very slowly. The Lithium Tantalite crystals for noise filters in cell phones and Sapphire crystals for LED substrate are examples of crystals made using this method. Iridium has a very high melting point of 2,400 degrees Celsius, and a high resistance to corrosion. These tenacious characteristics makes Iridium ideal for crystal growth.